Ultimate Ears has long been the leader in portable Bluetooth speakers. 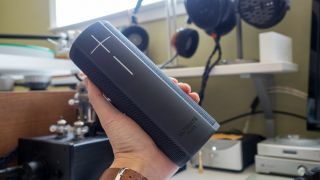 It was a title it claimed when it released the UE Boom 2 and UE Megaboom in 2015, then solidified with its Alexa-equipped UE Blast and UE Megablast last year. ...there was just one problem. Neither the UE Blast or the UE Megablast played nicely with Spotify, the world’s largest streaming service that hosts over 150 million active users. But Ultimate Ears is ready to fix that with a patch that will bring Spotify voice control, Spotify Connect and better grouping functionality to the speakers. When the features hit, you’ll be able to request songs and playlists using voice commands, plus connect the speakers to a device playing Spotify without Bluetooth. On the other hand, the grouping functionality will allow up to group up to eight Megablast and Blast speakers on Bluetooth and Wi-Fi with greater range for grouped speakers and improved connection reliability. Ultimate Ears doesn’t have specific timing when the features will be ready to roll out, but says that all of the above will be available ‘later this year’.